Greetings to everyone. I am Aliya Ahmadova. Finally, SDW 2019, which we long foresee, begins. I am the manager of the “STEM Azerbaijan” project supported by the Ministry of Education of the Republic of Azerbaijan. As a project manager, I intend to provide active participation of Azerbaijan’s STEM teachers in the STEM Discovery Week 2019 events. For this purpose, we decided to organize the “My best STEM Lesson Plan” competition. Within the framework of the SDW 2018, the “STEM Azerbaijan” project has a number of activities from different school of the region. Students demonstrate a high level of activity and creative approach. “SDW 2018” events for the science teachers from different regions of Azerbaijan were organised, including training activities in science and robotics. During the training activities from 11:00h to 18:00h, teachers learned how to build Arduinio, robot through programming, ICT skills, and effective STEM lesson plans. Nearly 50 teachers of the “STEM in Azerbaijan” project actively participated in this event, organised at ADA University in Baku. WORLD Aviation and Cosmonautics Day on April 12! So another STEM holiday week is ahead. Are you ready to prepare a “water rack” with your students and test them in the yard of the school?Azerbaijani STEM teachers and their students will do it whith great pleasure. ● Reactive motion is when the body moves in the opposite direction when it moves with a part of it. For example, rocket movements are based on the principle of reactive movement. 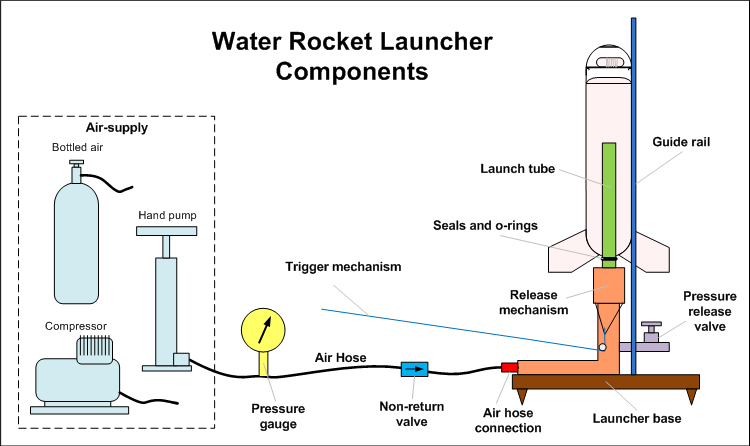 Principle of the rocket operation. The missile is a closed system of cover and fuel. Covered pipe, one side closed and one side is open. A soplo was worn to release the burning gas on the open side of the cover. When the rocket is turned on, fuel burns into high pressure gas. As the pressure of the gas is high, it is thrown into the atmosphere at a great speed from the rocket’s sling, and the rocket shifts to the opposite side . Supply: plastic bottles (1 liter), water (0.5 l), fungus goggles, pneumatic and pneumatic pumps that blow air to the ball. 1. Pour 1/3 of water into the bottle, close the mouth with a plug, place the bottle upwards on the rack so that it is at 40-50 ° angle to the horizon. Note: The “rocket” can be used to design the surface of the rocket, making it possible to paste additional details from the top of the bottle with a rocket image. What is the reason for the “rocket” acceleration? What kind of speed can this speed be calculated? Why is Novruz a holiday of STEM? Posted on 31/03/2018 03/04/2018 Author aliyaahmadovaCategories UncategorizedTags STEM holiday Novruz, STEM in Azerbaijan1 Comment on Why is Novruz a holiday of STEM?